Fill in the blank: Don't you hate it when ________? I make up fiction stories in my head. I just add on to it everynight that I can't sleep. How some people can just seem inherently evil and do horrible monstrous things. Don't they have a conscience? 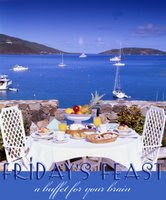 Go to the Friday's Feast HQ to join in! Chicken alfreao was also my favorite...I had it for lunch. All of this pasta talk had me cravin' some!!! Yeah, I saw your pic of it and it made me really want some lol! I loved your main course and your dessert. My feast is served if you would like to join.